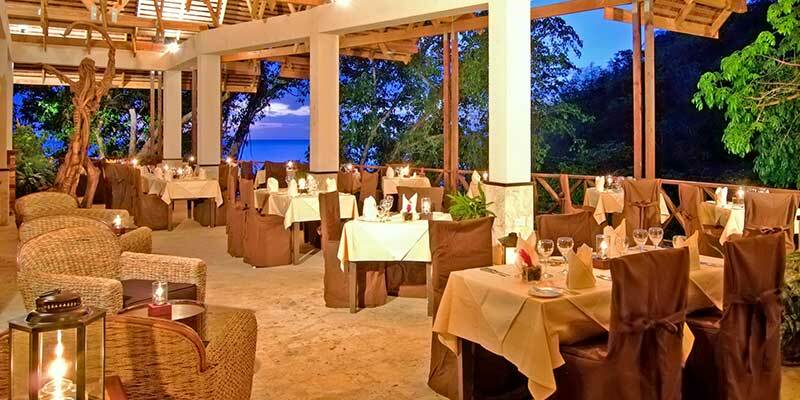 Perhaps what sets Anse Chastanet apart from the others is the owners’ emphasis on using local woods and other local products in the room decor and furnishings. Cushions and bedspreads are made from colourful cotton fabrics called madras, the island’s “national cloth.” The furniture has been individually designed and handmade in the region with the exclusive use of the island woods such as teak, mahogany, green heart, red cedar and wild breadfruit. All rooms have fridges, electric tea/coffee makers, wifi and wall mounted hair dryers, and in-room safes. Handmade bathrobes and Molton Brown amenities are provided. All rooms have king-size beds, en-suite bathrooms with hand basin, shower and toilet. Upon request, extra bed or twin beds can be provided. The Standard Rooms have either coralina tiles, clay tiles or tropical hardwood floors, glass or wooden louvered windows, balconies with varying views. The Superior Rooms have either coralina tiles, clay tiles or tropical hardwood floors, glass or wooden louvered windows, balconies and beautiful views of the Pitons and/or the Caribbean Sea. They are located at various levels on the hillside and they are octagonal or rectangular in shape. The Beachside Deluxe rooms are generous in space, with coralina or clay tiles and wooden jalousie louvre windows and large balconies or patios. All beachside rooms offer a tropical garden view and are just a few feet away from the beach and water’s edge. They are air-conditioned. This is an optional feature as louvres can instead be opened for natural air flow. 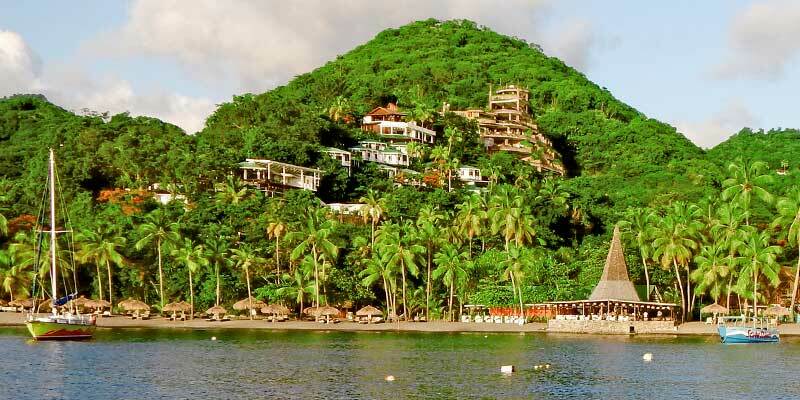 The spacious Hillside Deluxe rooms are located at various hillside levels with beautiful views of the Caribbean Sea and/or St. Lucia’s Pitons. Some rooms have the fourth wall missing entirely whilst others have wooden louvre walls and open room dormers allowing for excellent natural airflow. Some of the rooms have a formal separation between bedroom and living room, others are wide open spaces flowing into each other, with either coralina tiles, clay floor tiles or tropical hardwood floors, with patios and/or balconies. 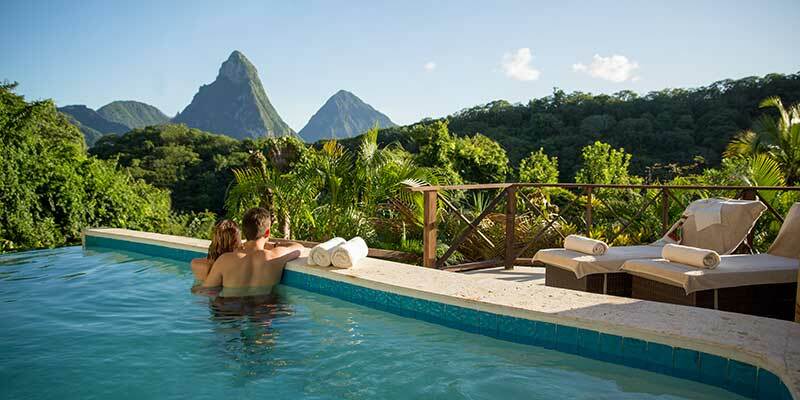 Anse Chastanet’s Premium rooms offer picture postcard perfect views of the St. Lucia’s Pitons – a Unesco World Heritage site- and the surrounding Caribbean Sea by virtue of their location on the higher hillside level. Some rooms have the fourth wall missing entirely, whilst others have wooden louvre walls which open to balconies/patios. Exquisitely finished with coralina stone tiles and hand crafted furniture made from tropical hardwoods. 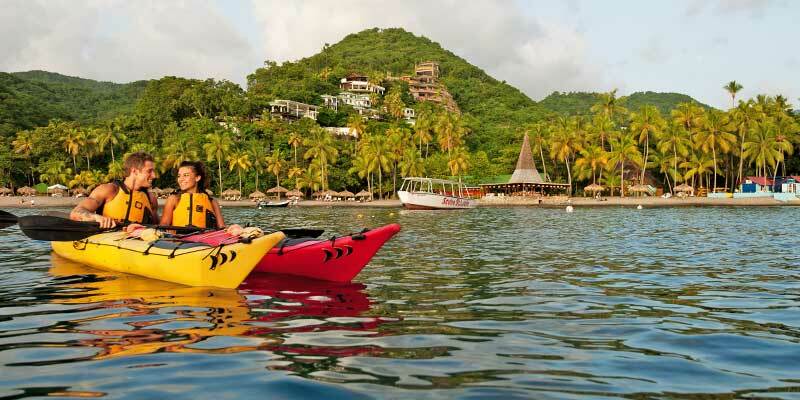 Casuarina is nestled amidst lush foliage in a private hillside setting at Anse Chastanet Resort, facing towards St Lucia’s famous Pitons mountains and the Caribbean Sea. The spacious bedroom with walk in closet opens to a 420 sq. ft. open walled patio-living room area. The grand bathroom with Piton view features a “Couples” Shower with “His” and “Hers” rain shower heads. Casuarina has a private 160 sq. ft. pool surrounded by a pool deck of 135 sq. ft. Upon request, the suite can be connected to a second room, creating an inter-connecting two bedroom two bathroom suite. Located on the north corner of Anse Chastanet beach you can sit and relax and look out over the sparkling Caribbean Sea, watching sunsets year-round from your elevated brick deck in the landscaped oceanfront garden. The interior is bright and airy, bathed in warm Caribbean sunlight shining through its French doors and windows. The interior decor of the Beach House is a celebration of Saint Lucia’s heritage which saw the island change hands between the French and the British 14 times. From the beach level, next to the flower garden, you walk up a few hand-hewn stone steps, across your personal stone-column, gated bridge, onto the brick pathway, with its wind sculpture and antique sundial, leading to your spacious 450 square foot covered patio. To rinse off sea salt and sand, simply dip under the outdoor shower adjacent to the brick pathway. The covered patio has a garden and roses on one side and an herb garden, flowers and a water feature on the other. In suite amenities include air-conditioning, refrigerator, espresso/coffee maker, in-room safe, bathrobes, slippers, hair dryer, iron and ironing board, Molton Brown amenities and free wi-fi.